Ben Folds Five was an alternative rock trio formed in 1993 in Chapel Hill, North Carolina. 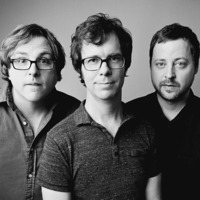 The group comprised Ben Folds (vocals, piano, and principal songwriting), Robert Sledge (bass guitar and backing vocals), and Darren Jessee (drums, backing vocals and co-writer for some songs). The group achieved mainstream success in the alternative, indie and pop music scenes. The band is best known for the hit single "Brick" from their 1997 album Whatever and Ever Amen, which gained airplay on many mainstream radio stations. The group reunited for a one-off concert on September 18, 2008, where they played their final album, The Unauthorized Biography of Reinhold Messner, in its entirety.